You can’t go through the Easter period without hot cross buns. They’re traditional! Homemade are, of course, the best. These super delicious choc cross buns are made with a pre-ferment and have a chocolate cross painted on the top. I originally planned to make hot cross buns on the customary day of Maundy Thursday, but what with one thing and another, action was postponed until Good Friday. I based these choc cross buns on a mish mash of recipes and techniques, I suppose you could call it fusion baking. It had to be Andrew Whitley for his pre-ferment, use of wholemeal flour and pre-soaked fruit. Dan Lepard has one of my favourite kneading techniques, so I went with his for that part of the bake. I used Peyton and Byrne for quantities (more or less), and Rachel Allen for spices. You can use whichever kneading technique you prefer, but the one I’ve given for this recipe produces a splendid result and requires no additional flour. I used a homemade fruit liqueur to soak the fruit in, but you can use a fruit syrup or just plain water. I also substituted my homemade candied orange peel for commercial mixed peel. It’s well worth making if you have time. I was wondering about the best way of incorporating chocolate. I wanted to retain the qualities of a traditional hot cross bun, so shied away from adding chocolate to the actual mix. It was CT who suggested making a chocolate cross on top and calling them Choc Cross Buns. What a wonder he is. As soon as the buns were baked, we immediately and greedily stuffed down two each. They smelled so heavenly. Luckily they tasted pretty sublime too. You can click on the following link to get the full list of all my Easter bakes. And for even more ideas, head over to my Easter Recipes and Ideas Board on Pinterest. I’m sending these Easter hot cross buns over to Javelin Warrior’s Made with Love Mondays where everything is made by scratch. I’ve invited several friends over for an Easter tea tomorrow. There’s a number of Easter bakes in the offing, including a simnel cake, but this is the only recipe I’ve got time to post. So I’m submitting these Choc Cross Buns to the Easter Extravaganza themed Calendar Cakes hosted alternately by Laura Loves Cakes and Dolly Bakes. Easter Choc Cross Buns. PIN IT. Thanks for visiting Tin and Thyme. If you make these scrumptious hot cross buns, I’d love to hear about it in the comments below or via social media. Do share photos on your preferred social media site and use the hashtag #tinandthyme, so I can spot them. For more delicious and nutritious recipes, follow me on Twitter, Facebook, Instagram or Pinterest. These super delicious Easter hot cross buns are made with a pre-ferment and painted with a chocolate cross on top. You can use your preferred kneading method or the one I've given in this recipe which gives an excellent result. Soak the raisins and homemade mixed peel in 20ml hot water and the liqueur or syrup whilst getting on with the pre-ferment. Mix the yeast with 150ml warm water and the milk in medium sized bowl. Add the sugar and 150g of flour. Stir, cover the bowl in a plastic bag or tea cloth and leave in a warm place to do it’s thing for an hour. Put flour into a large bowl with the sugar, spices and salt. Rub in the 20g butter with the tips of your fingers. Add the pre-ferment and knead in the bowl for 10 minutes. This way you don't need to add extra flour. Add the soaked fruit and liquid and knead for a further 5 minutes. Cover with plastic or a tea towel and leave in a warm place for 30 minutes or until it's doubled in size. Knead as you see fit until the dough is ready, adding the additional 25g butter. Or follow the process I've given below, which gives a really good result. i) Oil your hands and the work surface and turn out the dough. ii) Stretch it into an oblong shape and plunge your fingers in to aerate the dough. iii) Fold one third into the middle and cover with the other third trying to trap as much air in to the dough as possible. iv) Give a quarter turn. v) Repeat the process, only this time cover with pieces of unsalted butter (25g) before folding in much the same way as for puff pastry. vi) Repeat the process again with another 25g of unsalted butter. Divide into 14 pieces, form into balls and place a little apart on a baking tray or two, depending on the size of your tray. Cover with a tea towel and leave to rise in a warm place until doubled in size (about 30 minutes). Make a flour and cocoa paste by mixing 4 tbsp of water with the strong white flour, cocoa and chilli powder, if using. Pipe the cocoa paste across the top of the buns to form crosses. Bake at 220℃ (425℉, Gas 7) for 15 minutes or until the buns are golden and sound hollow when tapped on the base. Dissolve 50g caster sugar in 60g water by heating it gently in a pan. Brush over the buns to glaze as soon as they are out of the oven. If you follow the process for kneading I've given, you won't need to add any extra flour and the buns will have a better texture for it. What a wonderful batch of Hot Cross buns. I am hoping to enjoy lots down here in Cornwall over this week. I think chocolate cross version is such a god idea. Enjoy more and have a lovely Easter! 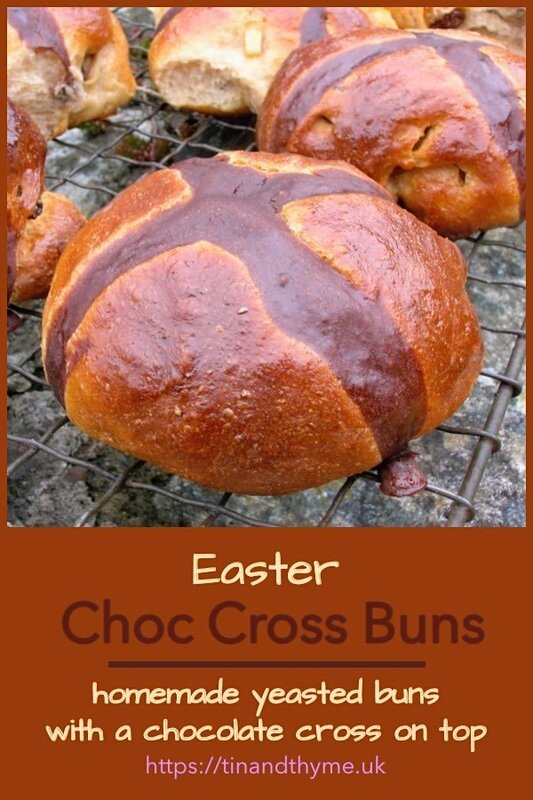 LOL, I LOVE these, I’m not making hot cross buns, but if I was, I think I might well be tempted by chocolate ones! Oooh they look beautiful. I’m going to make HCB’S today and these are my inspiration!! Amazing Choclette! These sound heavenly. I am away for the weekend, and am now wishing I was at home so I could get baking! These surpass mine, I can smell the chocolate from here! Next year, I’m totally stealing your chocolate paste crosses, looks fabulous! A very clever idea, CT is to be congratulated for the inspiration. You get the plaudits for the amazing looking buns. Happy Easter. love to have them with a cuppa..:) thnx for sending them over to my event ! choc cross buns, what a great idea. My kids dont like the proper ones and always get left out so these will be great. Glad to see a choc cross bun recipe from you Choclette 🙂 I love the sound of the redcurrant liqueur soaked fruit! Wow! Awesome recipe & these buns look so yummy! LOVE it! These look amazing! One for me to try that is for sure this Easter! Thank you Lucy. Every year I mean to make hot cross buns and only occasionally do I manage it.